I have a few minutes of free internet here in Shanghai and decided to check in. The experience here has been very gratifying, especially in the culinary arena. At least 95 percent of my photos are of kabobs and tofu and scallion bread grilled on the street, various sea creatures, food markets, tables full of food, restaurants and teahouses, and funny English translations of what exactly it all is. Eating Chinese food in the States, as most astute noshers know, is not much the same as sitting down to a Chinese family dinner or even going to a Chinese restaurant in China. – Arm yourself and your guests with only chopsticks and small ceramic bowls. – Prepare part of the meal beforehand, but keep that part in the kitchen. – When everyone is hungry and ready to eat, go out to the nearest market for 10 grocery bags full of fresh vegetables, fish, noodles, eggs, and perhaps a live chicken or two. – Saute each of your fresh ingredients in a wok with plenty of peanut oil. Sprinkle liberally with salt. – Begin eating each dish as it comes out of the kitchen, piping hot. – Don’t be shy. Reach around people to grab a mouthful of the newest dish, pour yourself tea, pour other people tea, and spit out unwanted shells or bones right on the table (or, if you want to be more polite, in your ceramic bowl). That is all! Until next time, happy New Year from Shanghai! As a Jewish vegetarian, I have to admit that one food has tugged at my lacto-ovo resolve: lox. It’s so tasty, and so available at so many Jewish functions. As fish, it already puts me on the moral fence, on one side doubting that a salmon’s level of consciousness is really that high and and knowing that the fish industry is a model of sustainability compared to factory farms, and on the other side knowing that the tasty, coral-colored stuff on that platter was once a salmon flitting through the water and leaping in the crisp Alaskan sunshine. So I’ve always faced a conundrum when it came to lox… until now. 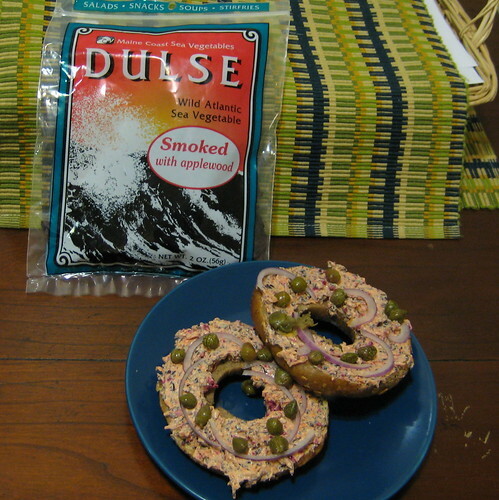 The other day I discovered smoked dulse, and a smokey, savory, dilemma-free heaven opened up. Dulse is a sea vegetable (now that I see what it can do, wouldn’t dare call it a weed) that I already loved to snack on or sprinkle on popcorn. Then, it seems, some brilliant individual decided to smoke it with applewood. The smoked dulse has the same iron-packed goodness as regular sea vegetable with an added yummy flavor. Combine cream cheese, dulse, garlic, beet and carrot (if desired, to achieve a lox-y color). Mix well. Serve on sliced toasted bagels garnished with capers and veggies. Tyler Cowan, author of Discover Your Inner Economist and a professor of economics at George Mason University, came to DC a little while ago. The fun thing about Cowan, according to my friend Alok who became riveted by the guy’s speech, is that he applies his normally snored-at field to everyday life, giving an economist’s perspective on falling in love, job searches, and—yes, you knew this was coming!—food. 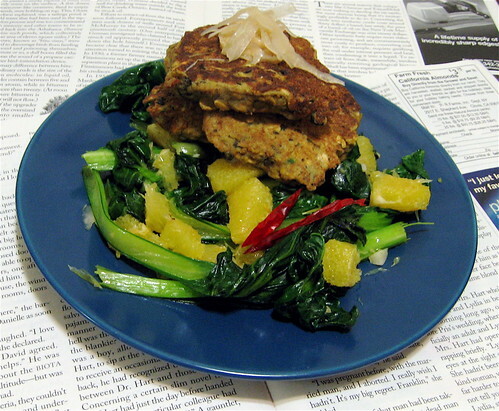 The Joy of Cooking is hiding things–ancient secrets that it does not deign to share with the general public. But I’m on to them. 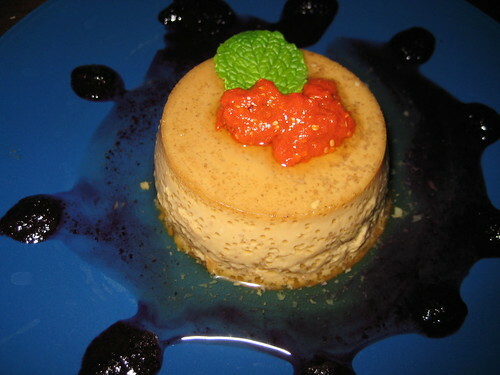 For instance, the other day I noticed something in their flan recipes. The JoC recipe calls for a caramel made with 3 parts sugar and 1 part water and then a custard with 5 eggs, 3 cups of milk, and a few other things. It served 8. The Jew and the Carrot blog is all over this. While I was still marveling at folks who are equally passionate about food and Judaism and delighting in the view of dozens of Chanukah menorahs ablaze at the same time, the Hazon food bloggers were already serving up the events with tang and flare, not to mention thought and care. Yes, I watched three goats become ex-goats through Kosher slaughter and learned about the intricacies of the Farm Bill and the ins and outs of feeding inmates and school kids in New York City. I ate greens picked just a mile away and seitan marsala and Kosher kimchi. And yes, I got to see that one of my photos — Shallots in a Hurry — was part of the fundraising photo exhibit. But I haven’t been able to sit down and write much about it. Take a read. I’m still chewing. The other night, I discovered a charred gash as long as my pinky finger and about as thick marring the hardcover spine of a book. The image startled me. How had The Omnivore’s Dilemma received a burn two inches long and half an inch deep, through layers of dustcover and binding, without my noticing? My glasses, which had been sitting next to the book, were also burned. One lens now oozes permanently, creating a warped spot in the lower right corner of my vision. Did someone break into my apartment, burn my stuff with the lighter I had nearby to light candles, and leave? That seemed highly unlikely. But just to check, I tried holding the lighter to the book. It began burning a wider, messier gash than the one I had. The pinky-sized gash seems to have been made by a slower, more patient endeavor. Had it happened while I was sleeping? 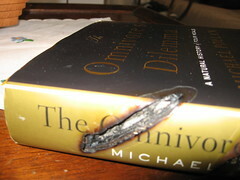 Did a spark leap from the electrical outlet and ignite the book cover in a flame that went out a few minutes later? It was possible, but I would have surely smelled that or felt the heat. Confused and unsettled, I gave up until the sun enlightened me the next morning. I picked up the book, put it down in the usual place on the night table, and noticed a bright, hot stream of light. The sun itself, with a slow and powerful presence, had reduced the work of human hands to ash and a carefully crafted pair of glasses to a fun house mirror. It seemed fitting that such a thing would happen to a book that dedicates a great deal of time to talking about the sun and the “free lunch” it provides. In Michael Pollan’s estimation, humans would be far better off if more of them followed the example of farmers who raise grass-fed animals (or, as the farmer Pollan follows calls it, farming grass). The idea is to let the grass soak up the sun and grow up to be tasty food, have the animals graze and poop on it, then eat the animals and/or their eggs and milk. The alternative is letting corn grow on sun and chemicals, processing the corn using polluting fuels and more chemicals, then feeding it to animals who may never have seen a blade of grass. Additional work comes in because the processed corn lacks antioxidants and generally animal-friendly elements found in grass. To round out this convoluted chain, the sun-shunning farmers must give their corn-fed critters tons of antibiotics. We could avoid this long second scenario, Pollan concludes, if we just harnessed the free and abundant power of the sun and kept it simple. I know for sure that it’s abundant, but its power is far from simple. 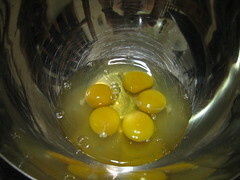 For generations, Jewish women (and, increasingly, Jewish men) have looked into a mixing bowl on a Friday and seen more than just eggs and flour. In the makings of a batch of challah, we have seen the oncoming shabbat, bringing with it rest and reflection. We have seen the community of people we will meet or pray with, the reading we’ll get done, perhaps the nap we’ll take when all that’s over. And, of course, we have seen ourselves a few hours hence tearing into some really tasty chometz. My mom and I brought back the challah-making tradition at my house when I last went to visit. We teamed up to churn out a big batch of loaves she could save for future Sabbaths. Every time I’ve made challah, actually, it’s been a community effort. The first time was with a group from Gallaudet learning from a local rabbi. And it wasn’t just me and my mom baking this last time — we consulted with a woman who makes challah every week at the local Chabad house, getting details and tips while we shared tidbits about our Thanksgiving plans. I must say the result was delicious, and ever so cute. 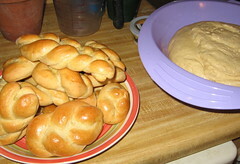 Although we were making single-serving rolls, we preserved the traditional braided shape. The outcome looked like the regular forearm-length loaves had been hit with a shrink ray and I could just imagine Ken and Barbie (or may Chen and Sari) putting two of these darlings back to back and saying the hamotzi in their tiny doll voices. I did not come away with a recipe I can recommend, mostly because the one we used gave the quantity of flour in pounds instead of cups. 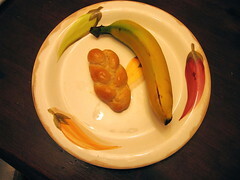 So if you would like to create your own challah, try one of these. Another interesting note: there’s no Jewish law that says challah (literally meaning separate, not bread) should be braided or full of sugar and eggs. It tastes mighty good that way, though. Although studies have yet to prove that the bumps of the braid improve the flavor, I’m convinced this is true. You’ve trapped, gutted, and cooked your own pumpkin. Good for you! But now you’ve eaten the yellowy orange flesh for breakfast, lunch, and dinner and even baked it into a large batch of cookies. You considered making pumpkin pie, but then realized that crust is not your bag. What to do? Sitting next to the ex-gourd is another sorry sight. You made a large batch of black bean burritos but, since you never measure, have a few cups of filling left over. Weekday mornings are not the time for heuvos rancheros—the best use for black beans as far as you’re concerned–and the leftovers aren’t calling to you for lunch or dinner. Qué problema! And then there’s the tatsoi you got at last week’s farmers’ market, a yummy Asian green that isn’t going to stay lush forever. Just above the tatsoi, an orange that selflessly gave its zest to a batch of scones now looks up at you, pith exposed, asking what will become of it. Do we have a problem? Hai!